It is quite obvious that Russia cannot substitute the West and in particular European countries with someone else. It is impossible for historical and cultural reasons, the abundance of industrial relations, geographical proximity and so on. Moscow can however substantially weaken such dependency through the strengthening of political, military, financial and economic relations with other countries which are friendlier and less susceptible to pressure from Washington. Islamic Republic of Iran (IRI) holds a special place amongst countries friendly to the Russian government, and strategic dialogue is being actively developed with it. It should be mentioned that the visit to Moscow at the end of January 2015 by the special representative, the foreign policy adviser of Iran’s supreme leader, Ali Akbar Velayati, was highly valuable to the development of Russian-Iranian relations. During this visit Ali Akbar Velayati met with President Vladimir Putin and delivered a personal message from the Iran’s Supreme Leader Ayatollah Seyyed Ali Khamenei. Beside him, the Russian representatives during the meeting with President Vladimir Putin were: the Minister of Foreign Affairs Sergei Lavrov and Minister of Energy Alexander Novak. It was not accidental that the latter was present. 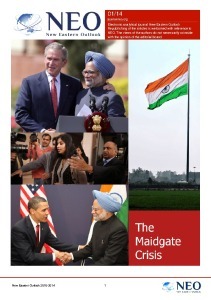 He was instructed to explore the possibility of new, “non-primary” forms of economic partnership between our countries amidst the collapse of world oil prices, calling into question the practicability of “the big oil contract” between Moscow and Tehran (“Iranian oil in exchange for Russian goods”). The main issue was preparing a new agenda for Russian-Iranian talks. In the economic sphere, it involves the realization of 5 major ready-to-implement projects: the construction of two new reactors at the Bushehr nuclear power plant, the creation of an “energy bridge” through Azerbaijan territory, the reconstruction of the Iranian railway, as well as a significant expansion of cooperation in the spheres of gas and agricultural products supply. This will partially replace Russian losses from financial and economic sanctions imposed against it by the West. Further strengthening of relationship between our countries is encouraged by the fact that Tehran, as much as possible, restrains the development of economic relations with Beijing in view of the real danger of expansion of the Chinese goods on its market. Since the economic potentials of said countries are incomparable, the opening of its market to the People’s Republic of China will lead to serious problems for some industries of Iran. 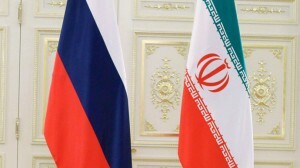 In these circumstances Tehran is very interested in the expansion of the Russian presence in the Iranian economy, especially in its strategic sectors such as energy, industrial equipment, transportation, and others. Nevertheless, cooperation on regional security is not of lesser interest, especially in view of prolongation and intensification of crises in Syria, Iraq, Afghanistan and Yemen. Positions of Moscow and Tehran coincide on the majority of aspects. They are particularly interested in the restriction of American, Saudi Arabian and to some extent Turkish activities. This allows to raise the matter of Moscow and Tehran creating new security systems in the Near and Middle East, Central Asia and South Caucasus. The distinguishing factor is that the said systems of regional security will be founded on a non-bloc basis and consideration of the interests involved in this process states. And the composition of specific participants of regional security systems will be determined by a number of factors, among which we should highlight not only the friendly stance towards Moscow and Tehran but also the possibility of actual participation in the settlement of regional problems. For example, Kazakhstan is the most likely partner in Central Asia. It is more difficult with regards to Afghanistan or Syria where Moscow and Tehran see different participants of such systems. Specifically in settling the Afghan problem Iran would like to involve India, while the Russian Federation wants to involve Pakistan. A similar situation exists in Syria where a possible offer to Egypt to participate in a new security system may encounter opposition from not only Tehran but also Damascus. The reason for this is that Egyptian authorities are too financially dependent on Riyadh as shown for example in their support of the international coalition against the Houthis in Yemen. But in reality Cairo isn’t planning on getting involved in this armed conflict until there is a real threat of closure of the Bab el-Mandeb Strait, connecting the Red Sea with the Gulf of Aden of the Arabian Sea. This strait allows the transportation of marine cargo, including oil-tankers, to the Suez Canal and then onward to Europe. One should especially consider the matter of establishing a security system in the South Caucasus. Here, Russia and Iran are compelled to rely on a rather difficult partner – Turkey. Nevertheless, it is entirely possible, despite Turkey’s membership to NATO, aspiration to enter into the European Union and considerable regional ambitions. The basis for this is the fact that the Russian government managed to build a partnership relation with Ankara in political and economic spheres. It was facilitated by several factors: economocentrism, geographical proximity and historically determined commitment to avoid mutual confrontation. Of course there remain serious misunderstandings between Moscow and Ankara on the Syrian and Yemen issues. In particular, the President Recep Tayyip Erdogan is still convinced that the removal from power of Bashar al-Assad, including by force, is necessary. As a consequence, Turkey remains a breeding ground of radical Islamist terrorists and provides them with considerable support in conducting military operations against the Syrian Army. Moreover, Turkey tries to convince the USA of the need to create, near the Syrian-Turkish border, a buffer zone to locate the Syrian opposition leadership, the multitudes of refugees and training camps for militants. But even there the Turkish army does not get involved in the fighting. It is a different situation in Iraq where Turkey is actively coordinating with the leadership of Iraqi Kurdistan, the President Masoud Barzani, in the economic sphere in exchange for a serious commitment not to interfere with the internal Turkish affairs, especially on the Kurdish question. Simultaneously, attempts are made to negotiate with the leaders of the “Islamic State”, which is reasonable considering the previous involvement of the Turkish secret service in the military preparation of Islamists for Mosul takeover. Serious activity of Ankara is observed in Yemen in opposition to Shiite Houthis that is caused by its dependence on Riyadh and its own regional ambitions. But all of this has no direct link to a security system in the South Caucasus. All in all, Russia and Turkey have enough difficulties cooperating in the Near and Middle East because of opposing views on the events in Libya, Egypt, Syria and Yemen. At the same time, cooperation between the two countries on Iraq, Lebanon and Palestine is possible. But this is practically non-existent in regards to Iranian-Turkish cooperation that is more of an economic nature. There are considerably more opportunities present for cooperation between Moscow, Tehran and Ankara in the South Caucasus. At a first glance, serious opposition is observed on the issue of ownership of Nagorno-Karabakh. But Russia, Turkey and Iran do not want to be drawn into a regional war with unpredictable consequences. Limited interaction of Moscow and Ankara on Abkhazia and even Adjara is also possible. More importantly, the joint efforts of the three countries to prevent the destabilization of Azerbaijan, where the decline in oil production, the radicalization of first and foremost the religious society and the brutal suppression of ethnic conflicts and any dissent are all increasingly growing socio-economic problems. This is partially resolved by the mass migration of the working population to Russia. However, against the background of said economic problems, including financial and economic sanctions of the West, a part of labor migrants will return to Azerbaijan and, not finding work there, will participate in anti-government protests under religious slogans. Special attention should be given to the issue of Russian-Iranian and Russian-Turkish relations in the conditions of the financial and economic sanctions imposed by the West against Moscow. For instance, according to Turkish sources, exports to Russia in 2013 were at an estimated $7 billion, of which $1.2 billion accounted for the product category that fell under the retaliatory sanctions of Moscow against European states, including fresh fruit and vegetables. The members of Turkish association of agricultural products exporters came up with an idea to equate the Russian import customs duties for goods from Turkey to European custom duties, which would allow increasing the above-mentioned $1.2 billion to $3-4 billion annually. In turn, Rosselkhoznadzor exceptionally allowed Turkey to import fruit and vegetables into Russia through the territory of Ukraine, notwithstanding the ban on import and transit of all vegetable products from this country, imposed on October 22. To do this Turkey assumed liability for the safety of such a transit. Both Turkey and Iran are certain that “sanctions are not the way that leads to expected results in politics.” And they are not compelled to observe them if such sanctions were taken unilaterally, i.e. bypassing the UN Security Council. As a result Turkey, despite strong pressure from the USA and its European allies, refuses to implement financial and economic sanctions against the Russian Federation, which serves as the foundation for the development of bilateral relations. In respect of Iran that practically has been under unilateral sanctions from the West since the moment of its inception, it is in principle impossible. Globally, Russian-Turkish relations have good economic prospects, which will allow for bilateral trade to double by 2020, representing $65 billion per year. 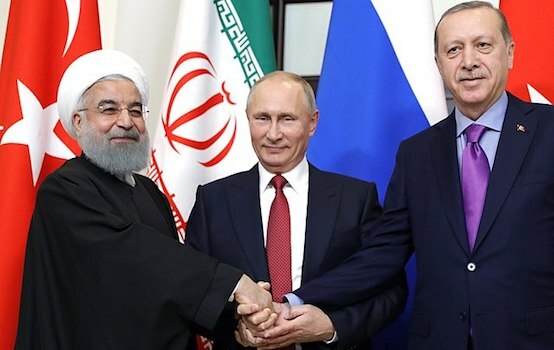 It serves as a reference for Moscow and Tehran, who should in the near future reach the $5 billion level in turnover with the prospect of increasing it to $10 billion (but even that will not allow them to reach the level of current trade relations between Turkey and Iran with an annual range of $15 billion). The move in this direction will allow our countries to build a solid foundation of trilateral relations, which is a prerequisite for the organization of a new security system in the South Caucasus. 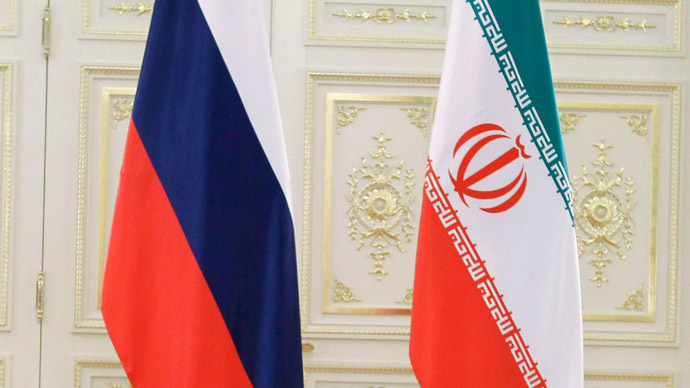 Russia and Iran have an important role to play in the formation of security systems in the Near and Middle East, Central Asia and South Caucasus. They are able to offer a new principle of their creation based on the non-bloc structure and consideration of the interests of states involved in this process. It is already possible to implement it in the South Caucasus due to the interest of our states and Turkey in maintaining stability in the region of Nagorno-Karabakh and nearby Azerbaijan. The basis for this is to strengthen cooperation of these states in the economic sphere. Vladimir Yevseyev, Ph.D, Head of Caucasus Department of the CIS Institute, exclusively for the online magazine “New Eastern Outlook”.